The Ben Brewer Young Architect Award recognizes excellence in ability and exceptional contributions by architects who are in their first ten (10) years of practice. The Award will be given for exceptional work and general excellence in the practice of architecture. The jury will consider contributions to team activities as well as individual efforts in its evaluative process. The Award is intended to recognize accomplishment rather than promise alone. The range of activities for which an individual may be considered includes, but is not limited to: design, the science of construction, literature, education, service to the profession, public service, historic preservation, research, urban design, government, industry, or architectural practice. Nominations may be made by any AIA Houston member or firm. Nominees must be members of AIA Houston and may be in practice alone or in association with others. Eligible nominees will have received their license on or after April 6, 2009. A brief biography of the nominee including a date of licensure, no more than three typewritten page. A listing and description of the nominee’s accomplishments, no more than three typewritten pages. Letters of recommendation from at least three (3) individuals who are familiar with the nominee in the particular capacity for which the Award is recommended. These letters should state why this candidate should be considered for the Award and refer to his/her accomplishments. Letters from clients, consultants, and civic leaders are encouraged. A portfolio containing detailed documentation of representative work in which the candidate was involved. The jury will consider contributions to team activities. Documentation should consist of written materials, photographic prints, reproduction of drawings and/or any other items that will aid jurors in evaluating the candidate’s accomplishments. No models or slides will be accepted. Nominees must be members of AIA Houston, licensed to practice architecture and within their first ten years of practice. The winner will receive a $2,500 travel stipend from the Architecture Center Houston Foundation and will be honored at the Celebrate Architecture Gala on April 6, 2019. The winner will also be the Chapter’s nominee for the TxA’s 2019 Caudill Award for Professional Achievement. All nomination materials are due no later than February 15, 2019. There is no entry fee. If there are questions regarding the awards program, please email Rusty. 2. Login to your AIA Houston account by clicking on "Login" at the top of this page. 3. 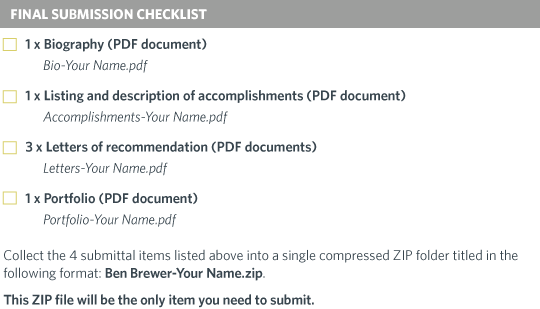 Once logged in, visit the document upload service and submit your zipped submission file under the "Other" category. Note: The service will be unavailable if user is not logged in.